Kooljaman at Cape Leveque is a unique wilderness camp which is surrounded by a diversity of natural wonders. The amazing wildlife, the vast array of marine life and the stunning coastline, makes this a truly unique experience. The two surrounding indigenous communities of Djarindjin and Ardyaloon (One Arm Point) jointly own Kooljaman, making it Proudly 100% Indigenous Owned. They have developed the camp in line with the community’s aspirations and their inherent knowledge of the land. Kooljaman at Cape Leveque has been established for 20 years and has won numerous state and national tourism awards in categories for Indigenous Tourism, Eco Tourism, Unique Accommodation and Cultural Tourism. Kooljaman at Cape Leveque has a variety of accommodation and has been designed to capture the rugged natural character of the Kimberley region. We are open 7 days a week all year round. We do not have alcohol for sale, however you are welcomed to bring your own. Ardyaloon community (One Arm Point) has a petrol station you can access 24/7 with either your credit card or debit card (18km from Kooljaman). Kooljaman General Store: We have a small general store, which has basic items available, such as barbecue packs, frozen bread, ice creams, UHT milk, ice, bait and some canned goods. No fresh fruit or vegetables are available. Community Shops: Both Ardyaloon and Djarindjin Community have shops which are open on weekdays with a good range of grocery items including meat, fruit, vegetables and supermarket items. Both shops are within 20 km of Kooljaman. 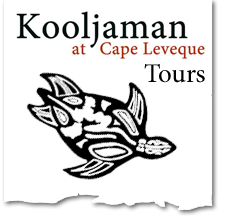 Kooljaman at Cape Leveque offers a diverse range of nature based activities. Guests can enjoy snorkelling with a beautiful array of tropical fish life, swimming in crystal clear blue waters, fishing, photography, beachcombing for unique shells, cultural tours, mud crabbing, learning about bush tucker, scenic flights over the Buccaneer Archipelago, charter boat trips, whale watching, bird spotting or the most popular activity of all – doing nothing but soaking up the sheer tranquillity and beauty of the surrounds.